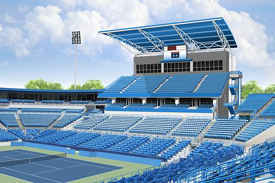 Cincy: secret tennis town and now an updated tourney destination? Cincinnati Ohio: World Tennis Mecca. That sounds not true. Unless you happen to live in Cincinnati. Or you've attended the Masters tournament there. This is how they describe the Cincy Masters on the event website: "The Cincinnati Western & Southern Financial Group Masters and Women's Open, the biggest summer tennis tournament in the US outside of the US Open." Which it is, even if you hadn't stopped before to contemplate it. (Click Here for more info). I'm not from Cincinnati, but I do qualify for an opinion because this is my third visit, so I will agree and say the tennis mecca part is definitely true. The salient point is this: like Indian Wells a few years ago, Cincy is under recognized as a tennis destination. Because of this, and other factors outlined below, you have the chance to feel the world tour at close range, right there by the side of the court, and in this case, while actually sitting in the major stadium(s). And you know what else? All this isn't really that suprprising, because Cincy has been a major tennis town for well over a hundred years. For starters, Cincinnati tennis players were playing a team competition against Great Britain before the Davis Cup was even invented. That's right Cincinnati versus Great Britain in the 19th century. 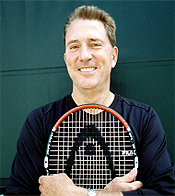 Brian Gordon: master of three dimensions and one conduit to the Cincinnati Masters. And point three, which may be the most impressive: inter-club league play was practically invented in Cincinnati, decades before anyone had heard of anything called a USTA league. Translation: huge, avid, knowledgeable fan base. In the greater metropolitan area, there are around 15 clubs with thousands and thousands of members. The Cincy league season runs from September to May, and during that time there is no USTA league play. USTA leagues are actually banned until summer when the real Cincy deal is complete. Which is somewhat ironic considering that the USTA now owns the Cincy Masters event. In fact Cincy was where he did some of his very first 3D coaching analysis. 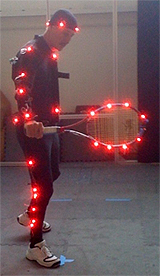 Now he is demonstrating his newest, amazing, quantitative technology on center court during the tournament this year. When Brian first started working in Cincy, one of the players he ran into there was Michael Kindred, retired software genius, bon vivant, legit 4.5 player (I know because we've hit), and avid student of the game. Brian introduced us, and it turns out Michael and I graduated from high school the same year, and he actually understood the 70s. But that's another story. The relevance here was that these two guys were the ones who first got me intrigued with the idea of filming at the event. And I am surprisingly glad they did. Michael Kindred, Giancarlo Andreani, a disinterested spectator, yours truly. Matt Barrett and Giancarlo at the super slow mo controls. 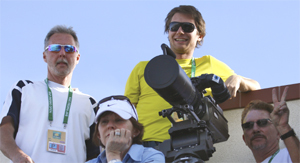 Michael eventually became a key part of filming team, helping handle the software on our incredible new high speed camera and squeezing the trigger to start the hard drive recording while I pointed the lens and tried to keep Nadal in the frame. By the time you read this, the women's event will be nearing completion, with the men's event slated to start on Monday August 13. This is a transitional year because Cincy is now on the verge of reaching the same status as Indian Wells event and Key Biscayne. That is, a Master's event that combines the men and the women. That starts next year. The payoff from our new high speed filming - Federer's forehand at 500 frames a second. Every tournament has a personality, and I have to say that Cincinnati's is definitely unique. The main stadium is much smaller and more intimate than Indian Wells. There is a second smaller stadium, and a third sort of stadium. But the outer courts aren't set up the way they are in the desert or Miami. They have only 5 courts maximum in play at a given time. But from our point of view the main stadium is fantastic because of the vantage points. This is our third year filming there, and the second year with our new high speed camera, and we're very excited about the footage we are generating for our new Stroke Archive. You've seen some small segments of that footage already in the Forum and there is a lot more to come. As I have written before, that camera is the same one used at the Super Bowl and other major sports for super slow motion replays. One of the vantage points in the main Cincy stadium. It's the next generation in high speed videogrpahy�the first major advance in about 10 years�with the capacity to record and store much more information, and to do this in true high def resolution. I firmly believe this data will take our studies of spin and the other technical mysteries in the game to the next level. The intimate stadiums are what make it great for the spectators as well as us, and everywhere I've been, I've encountered a different brand of tennis fan. 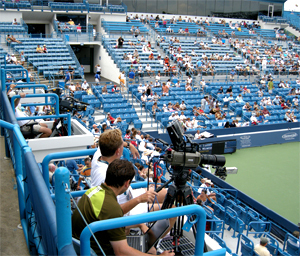 The best way I can describe it is that watching tennis in Cincy is much more like being at a football or a basketball game�except that the fans are fanatical about tennis. Let's just say that as a group they seem a little more adamant than the average tennis fan you encounter here and there. And friendly. And curious. In fact, I've had to explain what the hell we were doing with our cameras a few dozen times now, much more than at other events. And more amazing than all the questions is how interested everyone seems in the answers�stuff like the spin values on Rafa's forehand. And yeah, I see an opportunity to really build up our subscriber base there. The bridge from the airport into Ohio. Unlike most of the other events where people come in from all over the place, the majority of the attendees seem to be from Cincy, and they all seem to know each other. Hint: if you are from somewhere else, this is your opportunity. So picture this: it's summer in the Midwest--about 100degrees with heavy humidity. Everyone is dressed in shorts and tank tops and they are all way too tan, at least according to what my dermatologist says, and there is a lot of big hair (this is both the men and women) and a lot of heavy make up (this is mostly the women). So you end up sitting next to a nice 75 year old lady and her grown children (all hydrating Cincinnati style). And the whole family is vociferously encouraging their favorite player, which is usually any American player, especially, if the opponent by chance is not. So, yeah, it's a little different. But a big question is this: will Cincy become more of a destination event like Indian Wells? Well, that seems to be the hope and the plan. For this year's event they've reworked the stadium and the media facilities, and I am looking forward to seeing all that. The USTA is now the majority owner and is hyping the event as part of the whole road to the Open scenario. A cool downtown with the event an hour away on the big loop. But, as you consider the situation, it is important to note that the surrounding environment is very different from the desert resort utopia of Indian Well. So if you're thinking of going, you must prepare for a very different type of experience. And I mean very different. For starters, the event isn't in Cincinnati. It's in Mason, Ohio, known mainly for a giant amusement park called Kings Island. The Cincy downtown is pretty cool, but also relatively small, and probably less than 20% of the people live there. Most of the city is a series of loosely connected neighborhoods that are really more like small towns, separated by random acres of open space, with the whole thing surrounded by a gigantic freeway circle. From downtown Cincinnati, you've got to get on that loop, and it's an hour to Mason. Plus to get to Cincinnati in the first place, you have to fly to Kentucky. 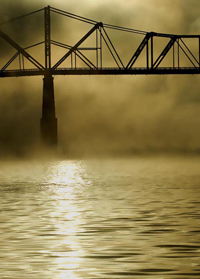 And from there you have drive over the Ohio River just to get to the right state, which can be another hour in bad traffic, which I can say, from personal experience, is very possible. But on the plus side, it's a hell of view of the Ohio River when you cross over the bridge. the Drop, the Wheel, the Coaster. Now some would argue that Mason itself is a worthy destination because of that massive amusement park. And I will say the place has some of the scariest looking rides ever. Want to strap in and drop 300 feet free fall out of the sky? No problem. Want to be rotated at high speed in a gigantic wheel way up in the air? You got it. And of course there is a really nasty looking giant roller coaster, and a lot more of the kind of stuff you would imagine. And that may float your boat or you may have children. 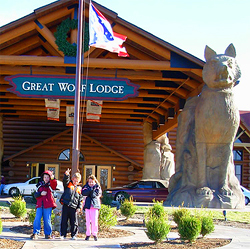 But other than King's Island and one weird looking big foot style hotel, (ok they call it the Great Wolf because of the giant wooden sculptures) there really isn't much else that I ever found in Mason. A lot of open fields, some gas stations, quick marts, and fast food places. The first year we decided if we just drove around we would have to run into a Starbuck's eventually. That turned out to be untrue, but we did end up totally lost on back country roads for about an hour. And I can say all this without being overly condescending because I grew up in the Midwest ok? I've lived it. The first two years in Cincy, we stayed with Michael in his suburban mansion, off an exit on the giant circle, which was great. It was spacious and comfortable and came at a very attractive price, ie, zero due to Mike's generosity. Selfishly though, he inexplicably rented the house to a nice family a few months ago. But no worries, now we're crashing at his palatial downtown condo complex. (I told you he was a retired bon vivant, right?) 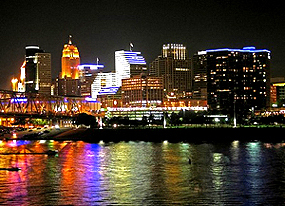 And I have to say I am looking forward to the urban Cincinnati experience, even if it is a daily voyage to the tourney. Over the years, just about every member of the Tennisplayer team has participated in the Cincy adventure, and this year Giancarlo Andreani and Matt Barrett get the call. It takes three people to carry that camera around, not to mention provide emotional support when the software crashes in the middle of a point. Then of course we have Michael to pull the trigger. But on balance I'll have to say that the event is truly fun and more than worth it. To me it's about the tennis and putting the lens on the best players in the world�then there is the bonus sociological experience. And I suspect any Tennisplayer.net subscribers who might decide to make the voyage will feel the same. It's a chance to get in pretty close to the ground floor on what is probably the next big thing in American tennis. Stay tuned for an update on what we come up with!